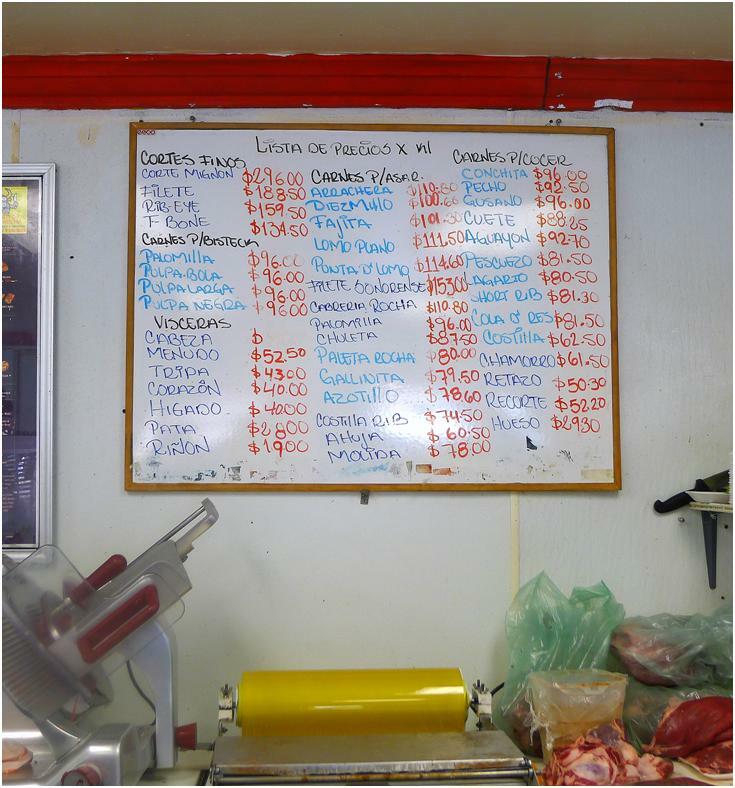 Of the many things that one might go down to Mexico to purchase, beef probably would not be high on the list. 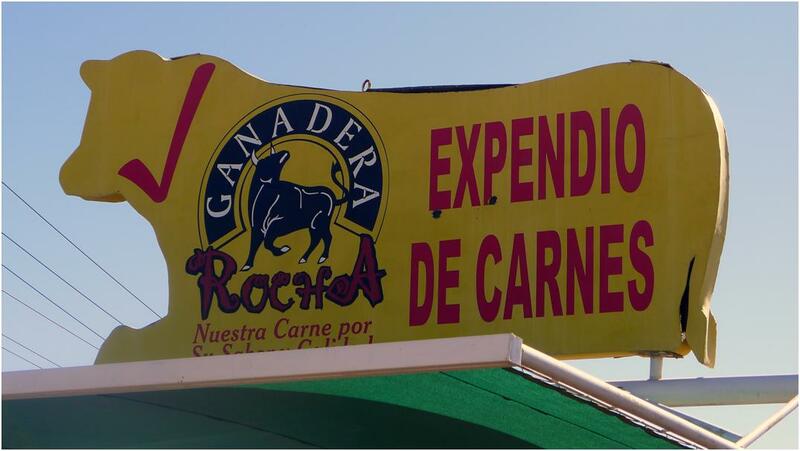 A visit to Expendio De Carnes Rocha in Mexicali – and two meals featuring Señor Rocha’s beef – has persuaded me to reconsider. If you are looking for his shop on your way South out of Mexicali you will find it beneath the big yellow cow. The selection of beef products on offer is astonishing. 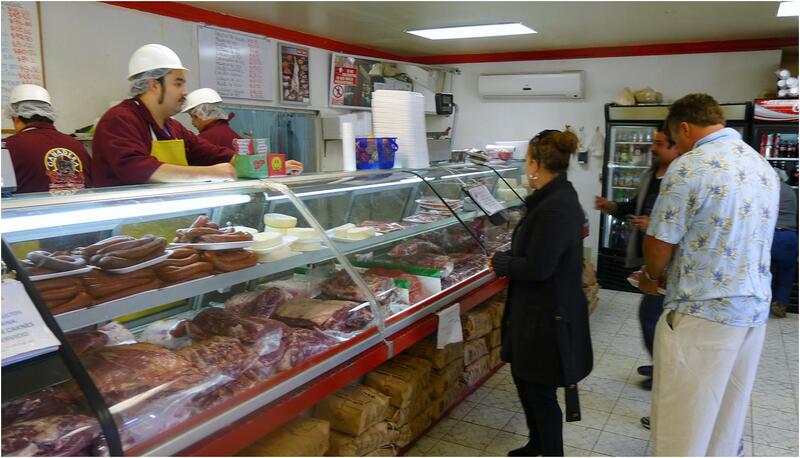 There are primal cuts, joints, sausages, offal and numerous other products. The skilled craftsmen will cut the joints to order for you. We ordered filet mignon (trimmed and cut into three inch steaks to our order) and short ribs (portioned before our eyes). Ordinarily, filet mignon is not a cut I purchase at a store or order at a restaurant. The price-to-value ratio is not there and it is not generally a particularly flavorful cut. 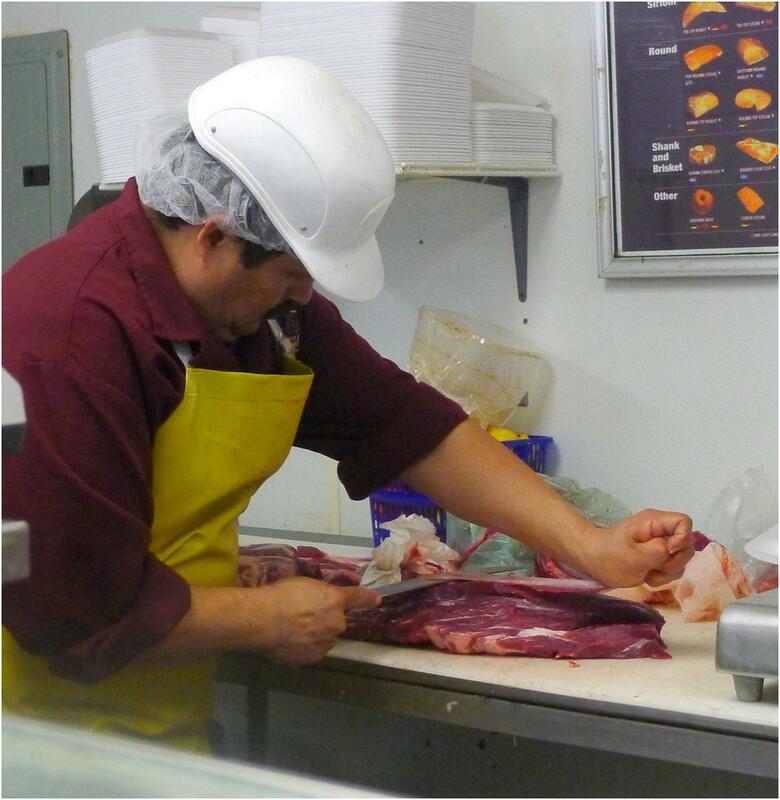 On advice of our friends – the Wickmans – who had purchased Señor Rocha’s meats on numerous previous occasions we bought the filets this time. They were terrific. These beauties were every bit as tender as filets usually are and more flavorful than any but a prime steakhouse rib-eye. Simple seasoning (salt and pepper) and pan roasting yielded a dish that showed just how good the meat really was. Even better than the filet mignon was the short ribs. The depth of flavor was profound and I was, once again, reminded why this is my favorite cut of beef. After a week in Mexico we decided to take the dish in a slightly different direction: North Asian Braised Short Ribs with Pickled Carrots and Daikon. It is a dish inspired by one of David Chang’s offerings from Momofuku. Braise the Short Ribs. Season the short ribs with kosher salt and freshly ground pepper. Add the ribs and the remaining short ribs ingredients (except the butter and grapeseed oil) to a large soup pot and bring to a boil over high heat. When the pot boils reduce the heat to a simmer. Braise the ribs for three hours until they are just falling off the bone. Refrigerate the Ribs in their Braising Liquid. Remove the ribs from the pot to a large metal bowl or other container. Strain the remaining solids from the braising liquid, reserving the liquid. Add it to the container with the ribs and refrigerate the ribs in their braising liquid to allow the ribs to reabsorb some of the liquid. This will also allow the fat to congeal on the top making it easy to separate the fat from the sauce. 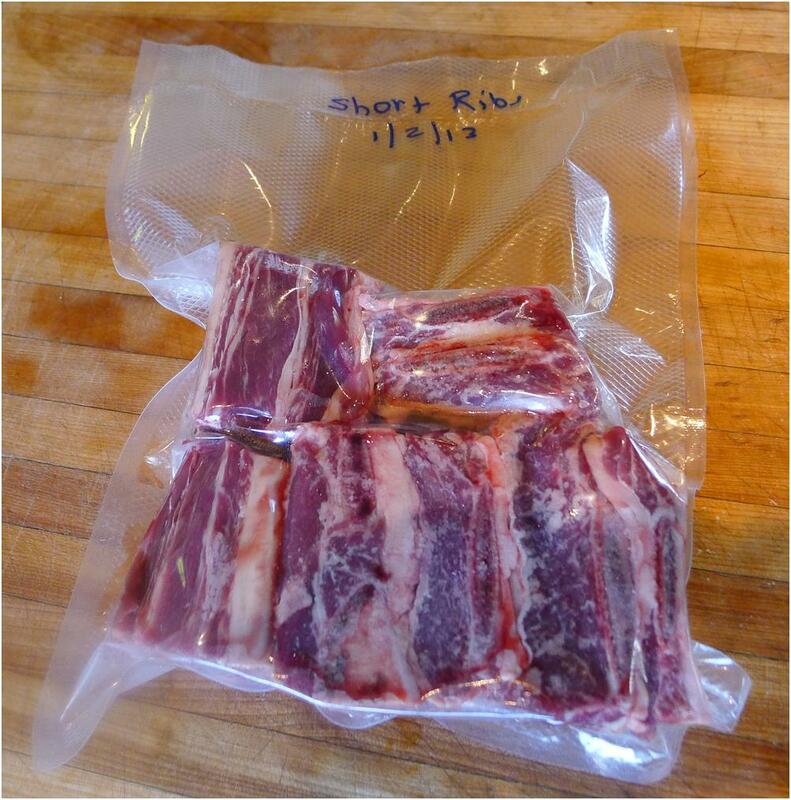 Refrigerate the ribs for at least three hours, better yet over night. Make the Pickle. Place the julienned carrots and daikon in a glass or non-reactive bowl and cover with boiling water for one minute before draining. Place the remaining ingredients in another large glass or non-reactive bowl and whisk to combine the solids and the vinegar. Add the drained vegetables to the bowl and let stand for one to two hours. Store in a refrigerator. Sear and Nap the Ribs. The next day (preferably), remove the ribs from the braising liquid and trim them off the bones. Transfer the braising liquid to a sauce pan and bring to a boil. Reduce the heat and simmer to reduce the braising liquid to a sauce consistency. If necessary (or, in your opinion, desirable) add some or all of the butter. Heat the grapeseed oil (enough to coat the pan) in a large sauté pan over high heat. When it is very hot add the short ribs and sear briefly on all sides. Spoon some of the braising liquid sauce in to the pan and continually nap the ribs, spooning some of the sauce over the ribs, to lacquer them. When one side achieves that lacquered look flip it to expose the surface that had been in contact with the pan and repeat. Blanch the Green Onions. Trim the roots and tops of the green onions. Bring a pot of salted water to a boil and blanch the green onions for 1 to 2 minutes. Plate the Dish. Arrange some Jasmine rice on one side of the plate (perhaps using a ring mold). Just to the center of the plate lay one of the green onions. Just to the other side of the green onion spoon some of the sauce on the plate. Arrange three short ribs on top of the sauce. 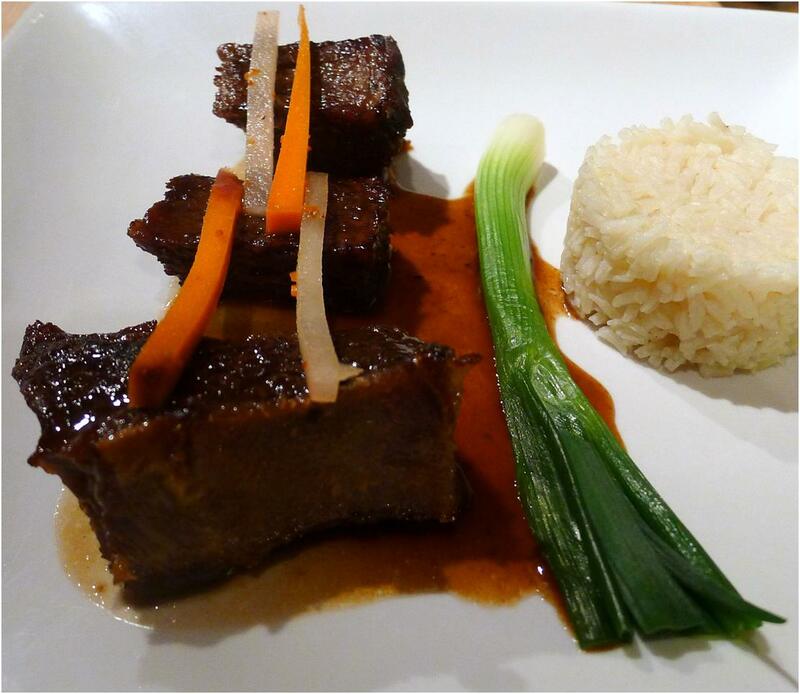 Arrange the pickled carrots and daikon on top of the short ribs. I’ll have to raise my game a little, don’t you think?